Subscribe to webcasts that explain how cloud builders, buyers and providers must use apps to squeeze the most money out of the cloud, and rPath’s platform-agnostic App GPS™ technology gets the app there faster, more consistently and reliably than any other solution. As enterprise IT and service providers face pressure to adopt cloud, deciding where to start and how to progress on the journey can be a real challenge. There’s simply too much noise and too few patterns or precedents to rely upon. 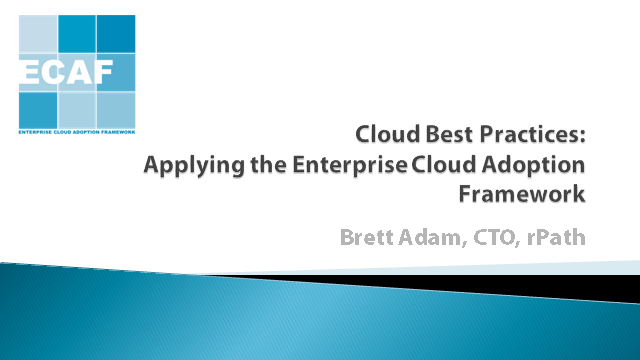 Join this timely webinar to learn about the Enterprise Cloud Adoption Framework, the first and only cloud adoption model that provides detailed guidance for how to think about the journey to cloud over a series of progressive investments. It’s designed to shine light on the paths in the journey to adopt cloud, providing the guideposts for making decisions. Automation is the underpinning of any data center or cloud transformation initiative, but the state of automation techniques is as diverse and varied at IT itself. In this session, some of IT's automation thought leaders will gather for an authentic conversation around many of the key challenges enterprises are trying to solve when it comes to cloud architecture, choosing a solution, and measuring value. Crossing the chasm from development and test of complex enterprise applications to actually deploying and keeping them up-to-date can be a treacherous trail lined with increasing customer demands, rapidly changing technology, and shrinking resources. Automation is key, and piecing together a scripted approach to automation won’t get you to the other side. That’s why rPath is bundling support and services to ease migration for users who’ve tried to achieve enterprise application automation with Puppet and have come up short. rPath customers can use Puppet bundling, including full support, at no extra cost.